What is in the oven today? These muffins, they look so good, are easy to make and my kitchen already smells delicious! 1. My name coming out of a hat! 2. I am also thankful for all the resources available to study and get ready for Christmas. 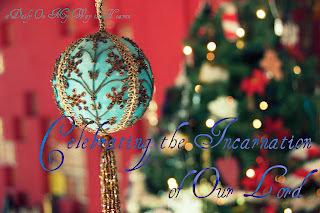 Sometimes we spend lots of time thinking about the decorations for our home during the Holidays that we may forget that this is a great time to study some doctrines that are essential for us to know. If we study the sound doctrine, and grasp what it really means Emmanuel, God with us, the Incarnation, God breaking into time becoming man, we will be able to celebrate fully and joyfully this Christmas season. You don't have to spend money to buy books if you don't have it, there are plenty resources available online for you to start studying today! Monergism offers a large list of resources here. Grace and Gems has a wide list of resources too. Find them here. Go to Ligonier to listen a teaching series entitled Christmas Messages. Desiring God also offers several options for you to study, check them out.